Important: All the necessary information on the KATANA Training Process can be found in the KATANA Ecosystem Group. To proceed in the KATANA process you will have to cooperate and form so called “consortia” consisting of up to 4 members and at least 1 beneficiary who has been selected during the peer to peer evaluation phase. 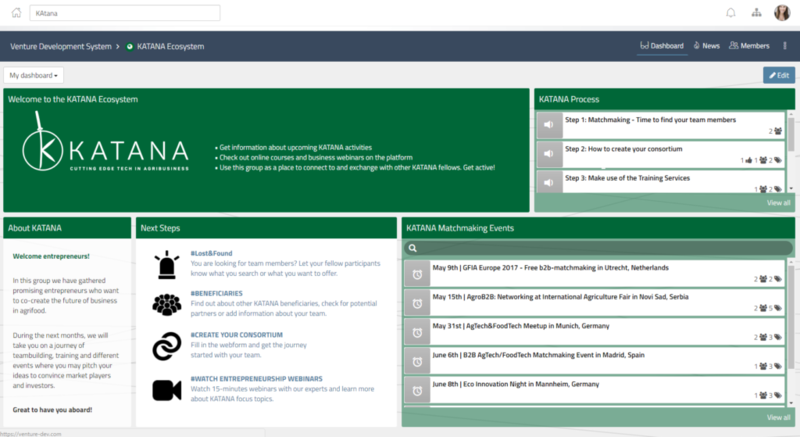 To help you in the teambuilding process the KATANA consortium will organize several Matchmaking events across Europe where you can meet other KATANA beneficiaries and/or other potential cooperation partners. Important: Every SME within the scope of KATANA can join in at this stage, also those applicants who did not make it into the final 100. You can find a list of all Matchmaking events in our KATANA Meetup Group which you find via this link. As soon as you have registered, you can find a List of the Top 100 beneficiaries in the KATANA Ecosystem. Here you can check out their videos and contact details from fellow participants or update your own profile. You may also find the other participants on our KATANA website and on our KATANA YouTube Channel as soon as we received feedback from all your fellow participants. You may contact potential partners directly via email or search for specific competencies via the Ecosystem group. In the section “Lost&Found” you can see what others are offering or searching for. Also, you can make an announcement yourself. You may also source the KATANA Pool where interested parties from outside the KATANA Top100 can announce what they may offer to teams and what kind of ideas they would like to support. The respective form can be found here. I found my team – what’s next? The matchmaking events as well as the list of beneficiaries, the KATANA Pool and the YouTube Channel shall support the KATANA teams in finding suitable team members for their KATANA project. The final project teams – the so called “consortia” – need to by either cross-country [meaning: consisting of members from different countries] or cross-sectoral [meaning: consisting of members from different sectors]. Consortia shall include 2-4 members of which at least 1 member has got to be a selected KATANA beneficiary. As soon as you have found your final project team, you may “create a consortium” in the Ecosystem group. You will need to make sure to provide all the necessary information [e.g. who is your partner? Is he/she also a KATANA beneficiary? What are you planning to do?]. The KATANA group administrator will then generate a personal team group where you and your team can access all the training materials and work on your business model. You found your partners and created a consortium? Then it is time to get the work started. In your KATANA Team Group you can develop your idea and business model further. Also, you find helpful documents, such as the Business Model Canvas, and information on the training services. Via the KATANA Ecosystem and the KATANA Team group you have access to various webinars dealing with different entrepreneurship topics. In the first phase of KATANA, it is recommended to watch these carefully. Every other Friday, you can address questions and learnings in an interactive online discussion via Skype. In case your questions are still not answered after the online discussion you may request a 1:1 online consultation with KATANA coaches. The online coaching will take place via Skype, registration will be possible via Doodle. The KATANA Bootcamp will be a 3-day-event with a networking and teambuilding event on 7th July, the coaching day on 8th July and the pitching day on 9th July. During the coaching day, you can attend different workshops covering topics such as Marketing, Teambuilding, Agile Development, IP Rights etc. as well as an intensive Pitch Training as well as 3 hours of 1:1 Coaching Sessions in the afternoon. Participation in the Bootcamp is mandatory for all KATANA beneficiaries. We will reserve up to 2 spots per team. You will receive an info pack with information regarding the course of action of the event, the venue and travelling details via email. You need to confirm their participation and fill in the online form as soon as possible after the reception of this email. The email will include the necessary registration link. You will need to prepare a presentation for your elevator pitch (2 Minutes) for the coaching and the pitching day on 9th July 2017. If they would like to use slides, we kindly ask you to send them to us before the coaching day until 5th July at the latest. Important: The best teams from each KATANA track will be given the chance to pitch their ideas at the Heidelberg Innovation Forum in the afternoon of the 9th July. If you plan to attend the Heidelberg Innovation Forum 2017 as a visitor you will have to register separately. After having the Bootcamp and Online Courses completed, teams will be asked to prepare their Crowdfunding Campaigns. To do so, you will use the KATANA Crowdfunding Platform that will be available for the teams by mid June. The Katana reward platform is open for all teams to test with and come back with questions but actual campaigns should be uploaded after the boot camp specifically the10th of July. The crowdfunding campaigns should all be uploaded until the end of August so that there is still a month for comments and feedback from the KATANA team until end of September when the campaigns should be final. You should use the Bootcamp and the respective workshops to gather knowledge on how to start your crowdfunding campaigns. We will have several crowdfunding experts onsite!